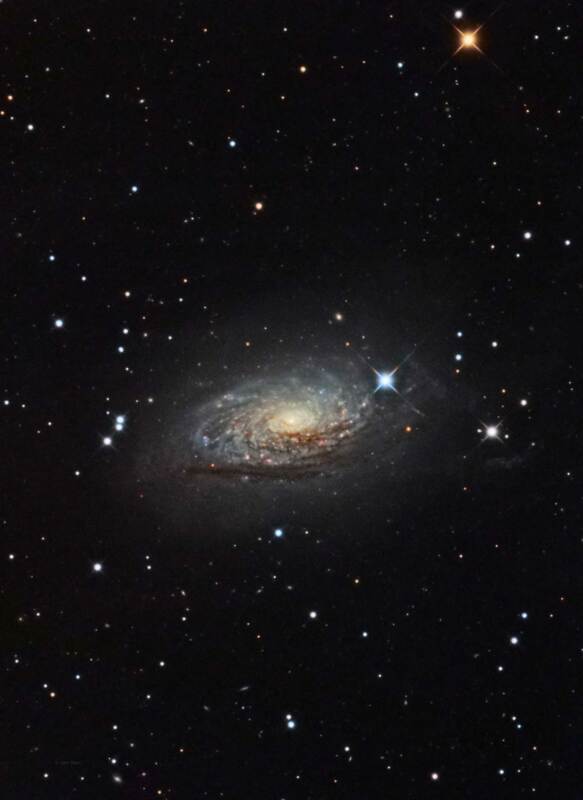 Messier 63 is a flocculent spiral galaxy in the constellation Canes Venatici. A flocculent spiral galaxy is a galaxy with several spiral arms that radiate out from the bright galaxy core. These arms are tightly wound and appear fragmented in areas. Many observers say M63 resembles a flower hence the nickname The Sunflower Galaxy. M63 is a large galaxy at 130,000 light years across containing about 400 billion stars. There are many areas of star formation in the arms of M63. These appear as reddish blobs in images and many of these nebulous regions are of the star burst variety. At the core of this star factory is a massive black hole about 30 million times that of our sun. There is a large but faint tidal stream around the perimeter of the galaxy possibly due to interaction with a dwarf galaxy around 5 billion years ago. This tidal stream is approximately 29,000 parsecs from the galaxy center at a width of approximately 3.3 parsecs. The tidal stream has been captured in earth based telescopes using visual filters and they appear as very faint, wispy clouds, elliptical in shape that follow the general shape of M63. One side of the tidal stream deviates from the elliptical shape and extends out away from the galaxy in a circular shape. The interacting galaxy has not been determined but this type of tidal stream has been observed in other galaxies and even our own Milky Way. Click here for a link that has a mouse over feature where you can see the tidal stream. Messier 63 is a member of the M51 galaxy group. This is a small group of seven galaxies with M51A/B the most prominent members. The M51 group is a member of the much large Virgo super cluster. This image was captured from a remote site with a limiting magnitude of 6.48 and a magnitude per arc second of 20.86. The sky was clear and humidity was about 30%. There was a light breeze at times in the 3-5mph range. This image was captured in a single sitting.